Harlem Désir is the representative on freedom of the media of the Organisation for Security and Co-operation in Europe (OSCE). Half a year ago, Saudi Arabian journalist Jamal Khashoggi disappeared after entering his own country’s consulate in Istanbul. It is presumed that he was brutally killed. His remains have never been found. Only six months, and yet it seems as if his violent, as yet unresolved death has virtually disappeared from the global conscience. His horrific end marked yet another awful pinnacle in the recent history of journalism. Hardly a week passes when my office does not react to cases of intimidation or threats against journalists. And too often, these threats are also carried out, whether it be a simple smear campaign or a contract killing. There is a tangible trend towards what I call the “universalization of threats” against the media and individual journalists. It is high time to raise the alarm about this. This constant threat not only impedes on the work of media workers but it also slowly erodes our democracies. It is not enough anymore to express shock, horror, sadness and all these other emotions we usually utter after such unspeakable events. Violent attacks do not happen in a vacuum; their ground is prepared by the prevailing political and social environment. As we should have learned by now, the relationship between society, political leadership and the media is a fragile affair. It can be jolted out of balance by virulent public debates, mutual blame-games and aggressive finger-pointing. And nowhere more so than in democratic societies, which rely so heavily on a healthy interaction between all these actors. The media plays a crucial role in a democratic system: it is the monitor, the critical thinker, the hard-hitting critique or simply a dissenting voice. But journalists will always be the messenger, never the actor. Don’t shoot the messenger – literally. Journalism has always been a dangerous profession. But the danger has now expanded from war zones and conflict areas to the midst of our own societies. This has been made more than clear by the killing of Maltese journalist Daphne Caruana Galizia in June 2017, the assassination of Slovak investigative journalist Ján Kuciak in February 2018, and the murder of five Capital Gazette staff in the US State of Maryland in June 2018, as well as the shooting of Montenegrin journalist Olivera Lakić in May 2018. And, not to forget, the terrorist attack against Charlie Hebdo in January 2015. On 12 April 2019, relatives and colleagues of some of these journalists will meet in Vienna for an international conference organized by my office. They will not only talk about their experiences but also send a clear message to political decision-makers: the media needs better protection. In the region I cover, which includes most of the northern hemisphere, more than 400 journalists have died in the pursuit of their work. In 85% of these cases, those responsible were neither arrested nor ever prosecuted. This is unacceptable. Worse, it is an encouragement for more aggression in the future. In December 2018, the 57 participating states of the Organization for Security and Co-operation (OSCE) took a landmark decision on the safety of journalists. The mere fact that this decision was necessary speaks for itself. It was timely, and it was necessary because it strongly states that “independent media are essential to a free and open society and accountable systems of government”. The decision calls on the 57 states to “take effective measures to end impunity for crimes committed against journalists”. It also urges “political leaders, public officials and/or authorities to refrain from intimidating, threatening or condoning – and to unequivocally condemn – violence against journalists”. It set an important marker but now it has to be implemented. In the end, it will be up to all of us to speak up when journalists are attacked. 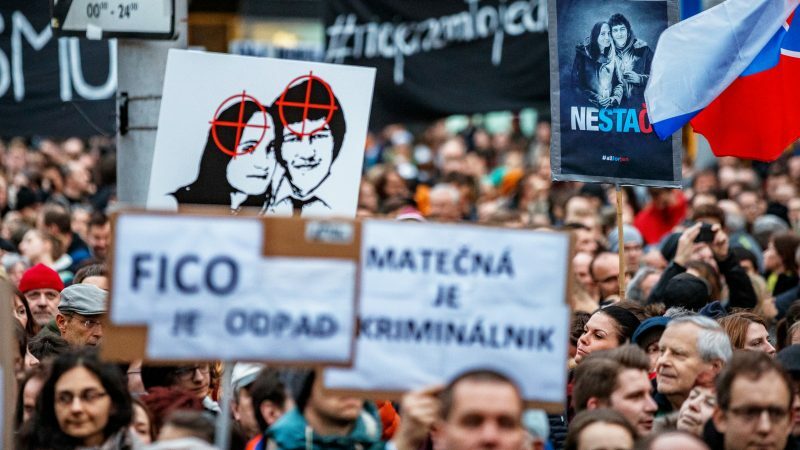 Nothing shows this better than the public outrage expressed in large-scale demonstrations in the cities of Slovakia after the murder of Ján Kuciak and his fiancée, Martina Kušnírová, or the protests in Malta and all over Europe after the killing of Daphne Caruana Galizia. In a few cases, justice came in the end, such as last week’s court decision in Serbia convicting former state officials for the killing of journalist Slavko Ćuruvija. Even though this conviction came 20 years after the murder was committed, I welcome such decisions as a step in the right direction. They are signs that the killed journalists are not forgotten, and neither are their murderers. We must continuously remind the political decision-makers that they play a crucial role in guaranteeing a safe environment for journalists, and, by this, support our democratic system at large. Blaming or attacking the messengers must stop; only when there is respect for different opinions will there be no safe haven for those who want to silence journalists.